Do you have a problem with dandruff, greasy scalp or baldness? If you do, it’s high time to visit a trichologist. What does a ‘hair doctor’ do? When should you seek the professional trichologist consultation? Explore this topic by reading the following article. Trichology became more recognized from the moment we have started paying greater attention to the issue of hair care. A visit paid to a trichologist turned out to be a great shortcut that leads us to the solution when we can’t figure out the causes of a particular hair ailment on our own, or when we don’t want to keep guessing what might be reason of our hair being in a poor state. As it is with a dermatologist, who we ask for help when we are affected with skin problems, similarly, a visit paid to a trichologist is recommended when your hair isn’t healthy. In plain English, this is a specialist who helps you understand needs of your hair. A trichologist is a ‘hair doctor’, yet it has little in common with medicine, though. This is a specialist who diagnoses and solves problems that touch hair and scalp. It’s worth realising that frequently the state of scalp translates into the state of hair. Trichology is a field of study that combines dermatology, cosmetology and hairdressing. It can be divided into two basic groups, each of them dealing with a slightly different methods of diagnosing and solving problems concerning hair and scalp. Medical Trichology – professional diagnosis and hair treatment with the use of medications and surgical procedures, e.g. hair graft. Cosmetic Trichology – recognizing the ailments and curing them using beauty procedures such as mesotherapy or cleansing rituals. The specialist gathers information concerning the way in which we treat our hair, and this includes: our lifestyle, cosmetics we use, conditioning/hair care practices we carry out, diseases we are affected by, etc. Also, this specialist defines the causes of worsening hair condition and, then, matches appropriate treatments or procedures which can be carried out either in a trichologist’s office or at a hairdresser’s. our hair has got clearly thinner. Furthermore, it’s a good idea to visit a trichologist when we want to choose the right method of conditioning our hair but we aren’t sure what type our hair is. 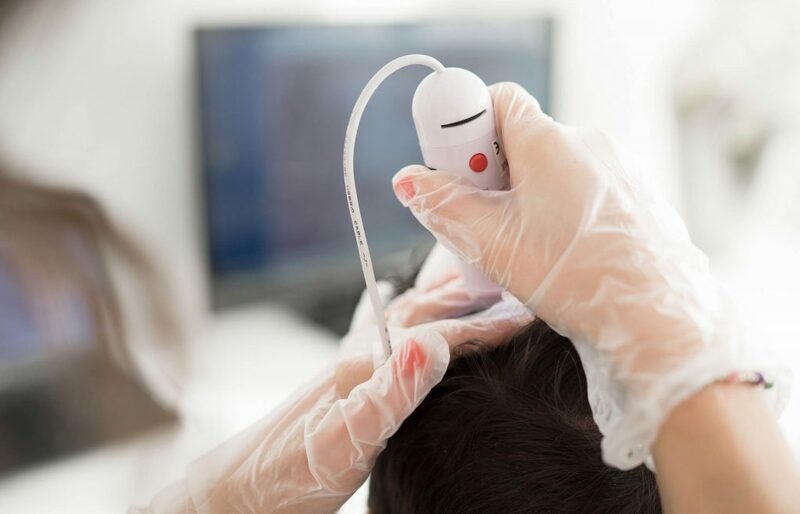 With the aid of professional tools, a trichologist is able to define hair porosity, state of hair bulbs and the condition of each hair individually. On the other hand, there is no one clear signal when we should arrange a visit at a trichologist. The truth is, it all depends on our needs. Some prefer to tackle the hair problems following some well-known remedies, whereas others go for a visit, out of curiosity, just to find out a few facts concerning their hair. Trichologist consultation is a visit that can be compared, on one hand, to a regular GP’s visit and, on the other, to a visit at a hairdresser’s. On one side, the specialists focuses on our hair but, on the other, it carries out very precise scalp and hair testes. Last but not least, it’s worth being prepared for our first visit at a trichologist’s. Firstly, a day before a visit, you shouldn’t wash the hair so as to make it easier for the trichologist to assess work of our sebaceous glands. Secondly, it is advised against applying any hair styling products and dying hair before the visit because this kinds of products can influence the results of tests a specialist will run. Thirdly, a trichologist might ask you to run special blood tests (e.g. CBC, hormone levels, thyroid gland hormones). If we happen to have current CBC results, you can bring them for your first visit. It may turn out that your hair is falling out due to lack of some vitamins or minerals.